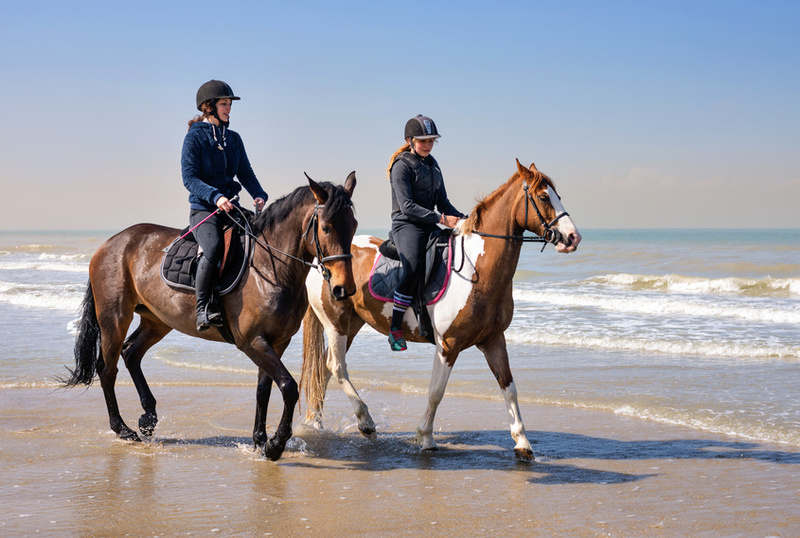 On horseback at the beach: common sense and tips to thoroughly enjoy an outing on the seashore ! Autumn is finally here. For many this season is filled with rain and temperature drops, for others it is the reopening of the beaches once again. It is now the time to refresh your mind, at the same time changing your surroundings, for our mind and our horse’s mind. Beaches are fabulous natural places where you can enjoy spectacular views, at the same time giving the horses a spa. However, it is essential to inquire about the information and access before hitting the road. According to the towns or villages where beaches are to be found, horse access can be regulated. It can be formally forbidden, partially authorised (sector and schedules), or fully authorised. Signs are placed at the beach entrances about these regulations. However, if you want to save some time, visit the tourist office website (or call the townhall) of the county council where the sought-after beach is to be found. This will allow you to immediately access beaches authorised for equines. The end of the summer season marks a greater flexibility, in terms of beach accessibility for horse riders. Also keep in mind to inquire about the nearby parking. If you are travelling a long distance, be sure to benefit of enough room to park your horseboxes and/or lorries, without bothering other beach goers. The beach is a very vast place, so it is necessary to be extra careful. Pedestrians, kite surfers, speed sails, are many various aspects to the extra precautions we should consider (mutually). Wear your helmets, we will never emphasise this enough… and keep a constant eye on your surroundings. Head immediately towards the wet sand, because the dry sand, deep and receding, is very bad for the horse’s tendons. For the individuals who are not use to the sea, walk for a long time, parallel to the water, before progressively allowing your horse to get used to this unfamiliar environment. Most of the horses, because of natural instincts, will get a fright of the sound of the water and of the small waves. The beach is a place where sand, salt and water intermingle, it is wise to prevent exposure to any irritations caused by the gear or wounds. If possible, use synthetic or gel girths, that are easily washable, the best being a cotton girth. The use of boots on your horse is not necessarily advised, simply because the sand may stay in them. If possible, try avoiding contact between leather and sea water…. There is a risk of damage and stains on your equipment. Prévoyez de l’eau pour abreuver les chevaux au sortir de la plage. Quelques litres pour se désaltérer avant de repartir ne seront pas du luxe. À votre retour à l’écurie, le rinçage du cheval Have some water ready for the horses to drink after the beach. A few litres to keep hydrated is not a luxury. At your return to the stables, the rinsing of the horse (on the girth passage and the entirety of the limbs), as well as the thorough washing of the equipment is essential.